Jonathan Weber is the Jefferiss Professor of Communicable Diseases and GU Medicine, and is the Dean of the Faculty of Medicine at Imperial College London. He is a clinician by training, and has undertaken extensive clinical and laboratory based research on HIV/AIDS, HTLV-I and other STIs. After general medical training he was a Wellcome Clinical Training Fellow at St Mary’s Hospital Medical School (1982-4), subsequently a Wellcome Trust Lecturer in Cell and Molecular Biology at the Institute for Cancer Research Chester Beatty Labs (1985-88), and then Senior Lecturer in Infectious Diseases at the Royal Postgraduate Medical School, Hammersmith Hospital (1988-1991). He was appointed to his current position at Imperial College in 1991, in order to establish a new academic department studying HIV and other STIs. Jonathan Weber’s work on HIV infection commenced in 1982, when he established the first UK cohort studies of the natural history of AIDS at St Mary’s Hospital, together with Tony Pinching. He then trained in retrovirology under Prof Robin Weiss FRS before establishing his own laboratory and clinical investigation centre. His work began with clinical epidemiology and natural history studies, then fundamental research on humoral immunity in HIV infection and viral tropism, and then to early phase clinical investigation of the emerging antiretroviral drugs, vaginal microbicides and potential HIV vaccine candidates. From 2018, he will be leading the first ever European HIV vaccine efficacy trial in 4 African countries, trialling a novel prime-boost immunisation strategy, using experimental HIV vaccine products developed at Imperial College, under his previous Wellcome Trust support. Jonathan Weber was the founding editor of the journal “AIDS” 1987-1992, the leading specialist journal in the field. 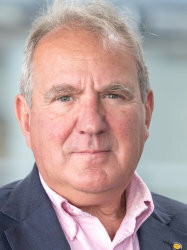 He co-founded the WHO Network for HIV Characterisation in 1992, and is currently a member of the Research Advisory Group for the Department for International Development (DfID), the MRC DPFS and Stratified Medicine Boards and the University Partnership Board of the Francis Crick Institute. He has published over 350 scientific papers on the clinical, epidemiological and virological aspects of HIV infection and other STIs.